Volvo Cars has been recognised by the United Nations for its ground-breaking electrification strategy in the latest report from the UN’s Global Compact, the world’s largest corporate sustainability initiative. The report, launched earlier this week at the Global Compact’s annual high-level meeting in New York, focuses on the progress that Global Compact members have made in supporting the delivery of the UN’s Sustainable Development Goals (SDGs). It highlights 10 chief executives that have taken particularly bold and disruptive action, including Volvo Cars’ President and Chief Executive, Håkan Samuelsson. The Global Compact has also recognised Volvo Cars as a LEAD member, a group of the most committed, engaged and ambitious companies within the Global Compact. A founding member of the Global Compact, Volvo Cars is one of only 44 LEAD companies out of a total of 9,500 members – and one of only two car makers. In the report, entitled ‘Business Solutions to Sustainable Development’, Håkan Samuelsson lays out the company’s reasoning behind the electrification strategy announced in July of this year. “We’re doing this because we think this is the right future for Volvo Cars, and that it will make us stronger. It’s sound business,” says Mr Samuelsson in the UNGC report. With the announcement, Volvo Cars became the first established car company to fully embrace electrification and place it at the core of its future business. From 2019, every new Volvo car launched will have an electric motor, marking the historic end of cars that have only an internal combustion engine. The electrification announcement was a watershed moment in the industry, and Volvo Cars’ example has been followed since by other car makers who have made similar announcements. 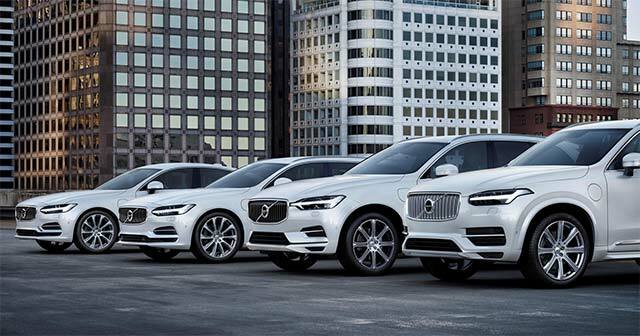 As part of its strategy, Volvo Cars will launch five fully electric vehicles between 2019 and 2021. Three of these cars will be Volvo models and two will be Polestar performance cars. These cars will be supplemented by a range of plug-in hybrid and mild-hybrid options on all models, representing one of the broadest electrified car offerings of any car maker. “Volvo Cars is leading the way and we can see now that the automotive industry is waking up to its responsibilities. We are proud to be a LEAD member of the UN Global Compact and of being acknowledged for our industry-leading commitment to an electric future,” said Stuart Templar, Director Sustainability at Volvo Cars. The full UNGC report and the interview with Mr Samuelsson on Volvo Cars’ electrification strategy can be found here.